The more energetic the particles produced by an accelerator, the more interesting physics they can create in the laboratory. Lawrence did not remain satisfied with the million-volt protons provided by his eleven-inch cyclotron, but hoped to increase the energy by a factor of ten or more. Higher energies required bigger magnets and faster oscillators. It also demanded more money. It was not a good time to raise money for research, as the U.S. reached the depths of the Great Depression. Universities in general suffered less than other segments of society. Still, in 1933 the physics department of the University of California at Berkeley had to cut its research budget by a third and impose an austerity program of lower salaries and fewer teaching assistants. 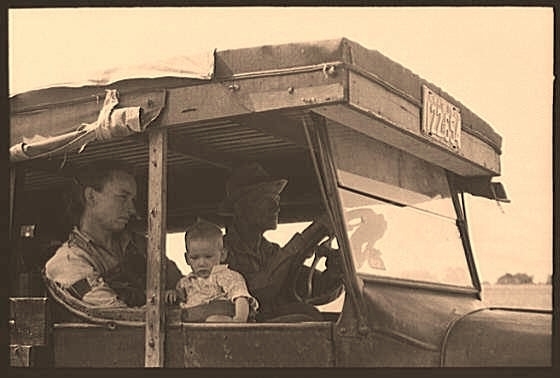 Refugee families encamped near Holtville, California. March 1937. 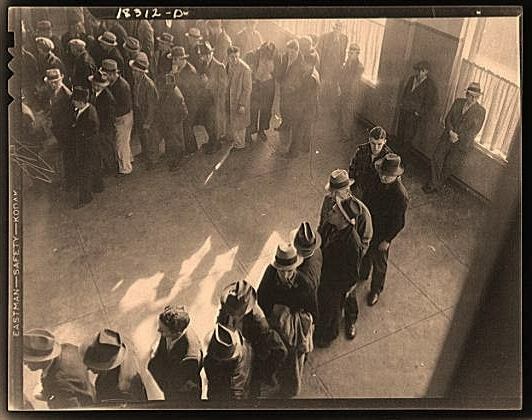 Men at the San Francisco State Employment Office. They will receive from six to fifteen dollars per week for up to sixteen weeks. "Cyclotroneers" encouraging a beam in the 27-inch cyclotron. Lawrence was obliged to seek new funding sources. He was as adept at fundraising as at building new devices and despite the grim Depression environment, he found donors for his next machine. One patron was the Research Corporation, a company that filed patents on behalf of university professors and plowed the proceeds back into academic research. Another was the Chemical Foundation, set up by the federal government to administer the thousands of German patents seized in World War I. The Research Corporation urged Lawrence to take a patent on his cyclotron. Lawrence at first resisted--like many prewar scientists, he did not think of academic research as a money-making business. But when he learned that an engineer at Raytheon had applied for a patent on a similar circular accelerator, the fear of an industrial monopoly made him file an application for the cyclotron (the patent was granted in 1934). Laboratory on the Berkeley Campus. The university provided the remainder of the funds and a building to house the new machine. In August 1931 an old civil engineering building was made available for Lawrence, which came to be called the Radiation Laboratory. The building housed a new 27-inch cyclotron, with an 80-ton magnet originally built to power a transatlantic radio link in World War I. Lawrence acquired the magnet at a discount as war surplus. By September 1932 the cyclotron was accelerating protons up to 3.6 million electron-volts. Click to hear the "Cyclotronist's Nightmare"
Ernest Lawrence at the controls of the 37-inch cyclotron about 1938. In what became typical for Lawrence, he was already planning his next machine before the current one started working. In 1937 he had a 37-inch cyclotron operating, followed two years later by a 60-inch device. To build the succession of machines Lawrence solicited $550,000 worth of expenses and equipment for his laboratory between 1931 and 1940. Donors included the state of California through the university; private philanthropies, notably the Macy and Rockefeller Foundations; and the federal government through the National Cancer Institute. Industrial firms donated equipment. "The trade of a �cyclotroneer' is one which has experienced no depression." Rad Lab staff demonstrated the potential application of radioactive isotope tracers in public lectures. A volunteer would drink a "radiosodium cocktail" of salt water containing radiosodium, and trace its progress through the body with Geiger counters. The federal government also provided support through two New Deal agencies, the Works Progress Administration and the National Youth Authority, which put electricians, machinists, carpenters, and other technical assistants to work in the Rad Lab on the government's payroll. 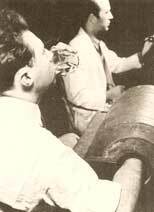 The Depression also produced a steady supply of physicists willing to work for nothing in order to learn cyclotronics. 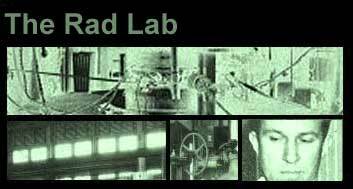 From 1933 to 1940 the Rad Lab had several graduate and postdoctoral students paying their own way at the lab. They helped the Rad Lab staff grow from a total of ten in 1932 to sixty in 1939. Lawrence found another important way to elicit fundsappeals to biomedical applications. Lawrence's colleague David Sloan had put his linear accelerator to work at the university's medical school as a powerful source of X-rays. The example encouraged Lawrence to promote similar applications of the cyclotron, such as the production of radioactive isotopes, which had medical uses in attacking cancers and as "tracers" in research on metabolism, and beams of neutrons, which promised to rival the utility of X-rays. 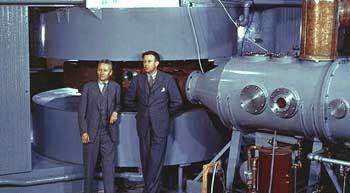 Posing with the newly completed 60-inch cyclotron in the Crocker Laboratory are (left to right) Donald Cooksey and Ernest Lawrence. brother, treat a patient with neutrons from the 60-inch cyclotron.